I wanted to make bread for our birthday celebration that I posted about in my last post. It needed to be simple because I had many things on my plate already. Then I found this recipe that you start the day before you bake it and I decided to try it. There are very few ingredients to the recipe; which I decided to add one thing, shortening, it didn’t list shortening as one of the ingredients and I thought I would get better results if this was added. 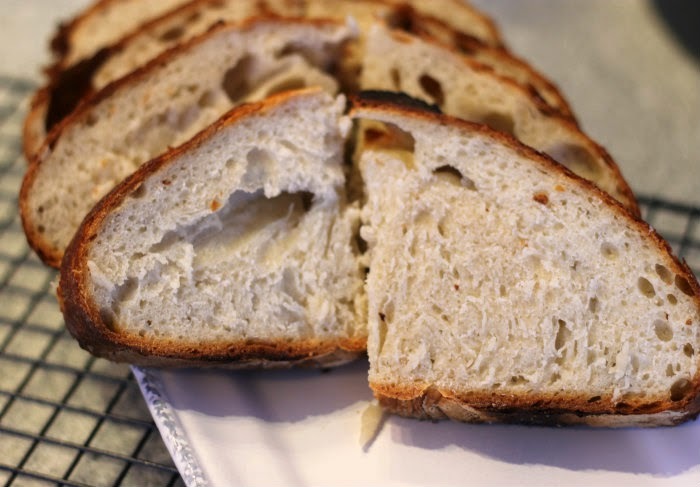 I have read so many blogs and comments where people say that they are nervous about making yeast breads, well let me tell you if you are one of those people you have to try this recipe. You will love it. 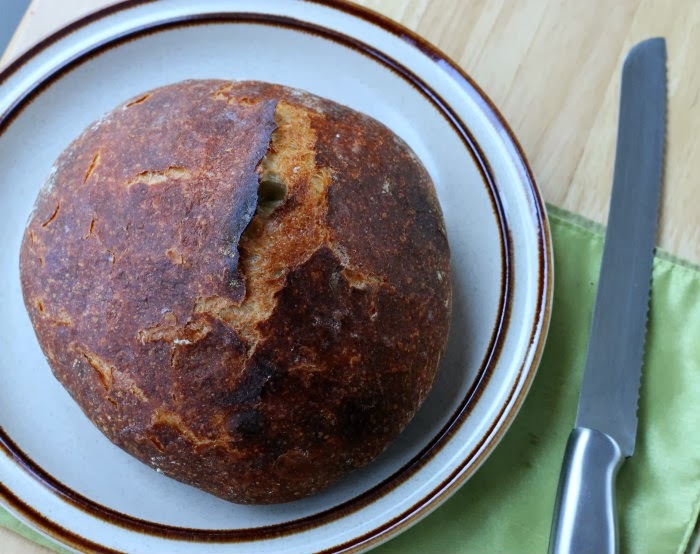 This is a totally different bread recipe than what I am used to; it is baked at a very high temperature and in a Dutch oven. Well it so happened that my mom was at our house for the celebration and I was explaining the recipe to her and let me tell you she really had doubts about this bread. 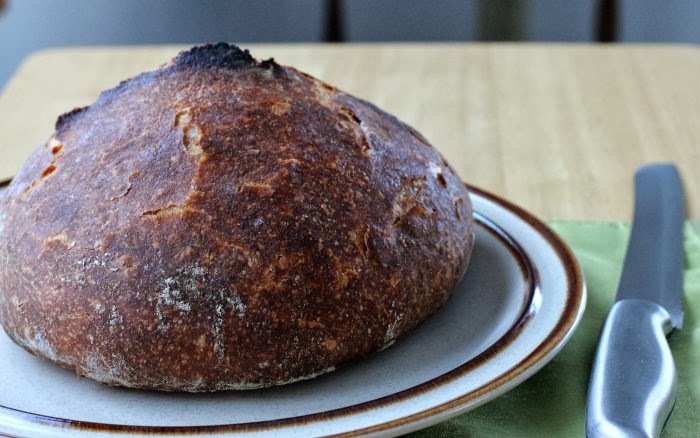 I have to add that I consider my mom an expert when it comes to making bread, she has made some of the most delicious bread in her life, so I was anxious to bake it and see how it would turn out. When the dinner was served I noticed that the first thing she tried was the bread and even my mom the bread expert had to admit the bread was pretty tasty. 1. In a large mixing bowl, whisk together flour, salt, and yeast. Pour in warm water and shortening and stir mixture with a wooden spoon until a ball forms. Cover bowl with plastic wrap and allow to rise for 12 to 18 hours (on the counter at room temperature). 3. Meanwhile, turn dough out onto a heavily floured surface then shape dough into a ball. Cover dough with plastic wrap and allow to rest while the pot is heating. Remove pot from oven and with floured hands, carefully drop dough into hot pot (don’t grease the pot) cover with lid, then immediately return pot to oven and bake 30 minutes (at 450 degrees). After 30 minutes, remove the lid from the Dutch oven and bake uncovered for 15 minutes. Remove from oven and allow bread to cool on a cooling rack. Slice and serve. Looks like it has such a gorgeous crust! Great loaf! This looks like just the type of bread I love to serve with hot soup on a cold winter night. And we’re expecting a nasty storm today! We do a lot of no knead bread. It’s easy, and soooo good! Yours looks great — thanks.